Did Buddha ask ask to worship him? 1. Did Buddha want us to make statues about him and worship him? I don't understand the point of doing this. I mean Buddha was indeed an admirable man, but I'm sure he wants us to help someone in need rather than worshipping his statues. 2. Is worshiping with flowers etc nessecary? Isn't it better helping someone else or doing some other good karma that actually has an effect on someone during this time. 3. Why do in some places small children are taken as monks. I mean you have to look no further than Buddha's life. He experienced all the pleasures in life and then understood it was meaningless and reached enlightenment. These small monks have not experienced these pleasures so how can they understand they are meaningless. Re: Did Buddha ask ask to worship him? I don't remember the sutta but the Buddha said the best way to worship him was to practice the Dhamma. You practice the Dhamma to see the Dhamma and thus see the Buddha. In another sutta, the Buddha says (paraphrasing): whosoever sees the Dhamma sees me and whosoever sees me sees the Dhamma. When the Buddha was close to death he said that he should not be worshiped, which is an indication that even during his lifetime people were starting to worship him. As with most ideologies, though, he was worshiped anyway...human habits are hard to break. According to the below sutta, only yourself and the dhamma should be your refuge, not the Buddha. "Monks, live with yourself as your island, yourself as your refuge, with nothing else as your refuge. Live with the Dhamma as your island, the Dhamma as your refuge, with nothing else as your refuge." Even if one should seize the hem of my robe and walk step by step behind me, if he is covetous in his desires, fierce in his longings, malevolent of heart, with corrupt mind, careless and unrestrained, noisy and distracted and with senses uncontrolled, he is far from me. And why? He does not see the Dhamma, and not seeing the Dhamma, he does not see me. Even if one lives a hundred miles away, if he is not covetous in his desires, not fierce in his longings, with a kind heart and pure mind, mindful, composed, calmed, one-pointed and with senses restrained, then indeed, he is near to me and I am near to him. And why? He sees the Dhamma, and seeing the Dhamma, sees me. That hankering one from one content! But thoroughly understanding Dhamma, And freed from longing through insight, The wise one, rid of all desire, Is calm as a pool unstirred by the wind. How close is that peaceful one to one at peace, That cool one to one cooled, That content one to one content! However, those statues are there for people who are "still far from the Dhamma". It might bring them some comfort and a little bit of merit. Dhammapada Verse 54: The scent of flowers cannot go against the wind; nor the scent of sandalwood, nor of rhododendron (tagara), nor of jasmin (mallika)2; only the reputation of good people can go against the wind. The reputation of the virtuous ones (sappurisa) is wafted abroad in all directions. Verse 55: There are the scents of sandalwood, rhododendron, lotus and jasmin (vassika)3; but the scent of virtue surpasses all scents. Generally monasteries have served as educational institutions in many countries, which is why you see many children ordain -- however, monks and nuns must prove they are trustworthy and are trained. Many children than disrobe if they don't think it's for them when they grow older, however, the discipline they keep forever. Children who were wise beyond their age and could see the dangers of sense desires and they themselves seeing the dangers of sense desires were allowed to ordain -- with the approval of their parents. mahat wrote: Children who were wise beyond their age and could see the dangers of sense desires and they themselves seeing the dangers of sense desires were allowed to ordain -- with the approval of their parents. I thought it had more to do with their having a bad horoscope. The Gautama Buddha never asked to worship him. 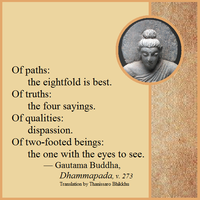 One who pays respect to the Gautama Buddha with the right understanding does not have a confused idea of the Gautama Buddha in heaven who could see him or hear him. The statue of the Gautama Buddha reminds him of the virtues of the Gautama Buddha. A Buddha statue is a symbol, and u pay respects/admiration to that symbol as a sign of u recognizing what he did and represents. If u are a boxer, u have a picture of Muhammad Ali in your locker. If u are a football player, u have a shirt of Messi. Its just the same thing. Its something to be done to arouse energy and motivation for the practice, worshipping has a different connotation. Buddha images were not made during the time of the Buddha. He allowed Ānanda to plant the Ānanda Bodhi Tree as a place for visitors to worship when the Buddha was away on tour. The Buddha made it clear that the best way to revere him was to practice his teaching. See the Mahāparinibbāna Sutta. He instructed a pagoda to be built when Arahants passed away. The Buddha's own son, Rāhula, became a monk at the age of seven. There were others who become Arahants at that age while being ordained. Some children are wiser than some old monks. It is not necessary to enjoy every kind of pleasure to figure out that they are the cause of suffering, just as it is not necessary to drink the entire ocean to understand that it is salty. Dhataraṭṭha, such is his name. “Reverence to you, excellent one! Worship has transformed Buddhism, which atheists have become polytheists! Hoa Sen Phật cập nhật thường xuyên tin tức Phật giáo, thần chú Phật giáo và pháp thoại Phật giáo. An important point on children who permanently stay at a monastery/nunnery is that often monasteries were and sometimes are a kind of orphanage. Children who could not be supported by the parents for whatever reason were often placed in a monastery. In the case of non~celibate clergy their children would be raised to inherit the family profession.